Shri Narendra Modi, Honorable Prime Minister of India today inaugurated India's first 14 lane Expressway - The Delhi-Meerut Expressway (Delhi Section) from Nizamuddin Bridge to UP border, proudly developed by NHAI and Welspun Enterprises Ltd. under Hybrid Annuity Model. Shri Nitin Gadkari - Honorable Union Minister for Road Transport & Highways, Shipping and Water Resources, River Development & Ganga Rejuvenation, Shri Mansukh L. Mandaviya - Honorable Union Minister of State for Road, Transport & Highways, Shipping and Chemical & Fertilizers, Shri Maheish Girri - Member of Parliament, Shri Rajendra Agrawal - Member of Parliament, Mr. B. K. Goenka - Chairman of Welspun Group and Mr. Sandeep Garg - MD & CEO, Welspun Enterprises Ltd. were also present on this milestone occasion. 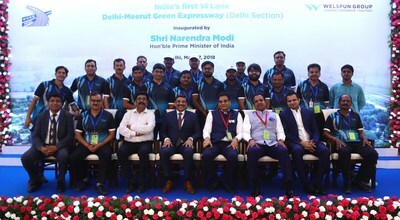 Accompanying him, Shri Nitin Gadkari - Honorable Union Minister for Road Transport & Highways, Shipping and Water Resources, River Development & Ganga Rejuvenation said "Congratulations to NHAI and Welspun Group for completing the green and sustainable Delhi - Meerut Expressway in record time. Welspun Group through its technological excellence has also been contributing to the nation's growth through its various businesses verticals and is proud to be associated with NHAI to develop various HAM projects. Commenting on the occasion, Mr. B. K. Goenka - Chairman of Welspun Group said, "We congratulate the Honorable Prime Minister on completing 4 successful years at the Centre and sharing his vision to transform and connect India. We are thankful and proud to be associated with NHAI under the Hybrid Annuity Model. Welspun Enterprises was the first Company to achieve the financial closure for this expressway project. We are proud to contribute through industry first initiatives like vertical gardens, cycling track, solar lighting and beautification of this stretch. The completion of this expressway along with NHAI strongly showcases our strength in Infrastructure and truly resonates with our philosophy of 'Leading Tomorrow Together'." Welspun Enterprises Ltd. developed the Delhi-Meerut Expressway (Delhi Section) in a record time of 18 months as against the scheduled 30 months, setting a new benchmark with operational efficiency and commitment. The stretch also features India's first Cycling Track on both sides, Vertical Gardens, Solar panels for Lighting, Drip water irrigation, replicas of prominent monuments like Qutub Minar & Ashoka Stambh, Advanced Traffic Management Systems (ATMS), CCTV's and plantation of new trees. The project consists of a six-lane expressway in the centre, flanked by two four-lane highways on either side - making it 14-lanes in total. Welspun Group, known for its various social initiatives, has played a key role in rehabilitating the slums on the highway. It also runs various social awareness programs with the local population in the areas of hygiene, women empowerment and education for children. It played a pivotal role in converting this expressway into a green belt with sustainable initiatives like drip water irrigation, solar plant and landscape development. Welspun Enterprises Limited (WEL), a part of the $2.3 billion Welspun Group (Pipes & Plates, Home Textiles, Infrastructure and Oil & Gas) operates PPP projects in various sectors like roads, water, and urban infrastructure. In the roads sector, the Company has a robust HAM projects portfolio of more than Rs. 69 Billion (Incl. L-1) with an past experience of operating six completed BOT (Toll) Road projects with a total length of over 500 km. Apart from that, the company holds equity investments in Welspun Natural Resources Private Limited (Oil and gas exploration).